The Hamilton is a great rambler-style home that offers spacious rooms and a variety of building upgrades. 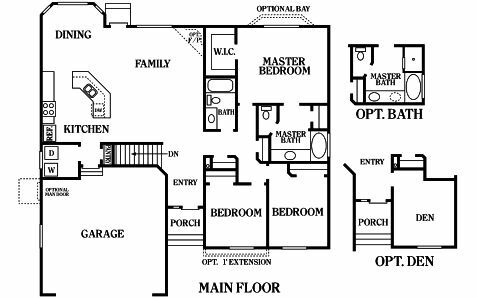 The initial floor plan features a garage, a large area where the dining, kitchen, and family area are located, as well as 3 bedrooms and 2 bathrooms. The home can be further improved by including simple customization options like a bay window in the master bedroom or a main door in the garage. However, if you’re interested in maximizing the Hamilton’s square footage, you can extend one of the bedrooms or include a den for extra storage space. Perry Homes Utah has been building heritage homes for over 40 years. Our company offers many different rambler and two-story homes that are affordably priced and exhibit top-tier construction. We also pride ourselves in providing quality customer service all throughout our process, from the initial meeting up until after the build. Interested in this home design? Then contact Perry Homes Utah today. Our design center personnel will walk you through our list of customization options, as well as advise you in choosing the right upgrades to ensure that you’ll get what you need even when you’re on a tight budget. Our home buying process is quick, seamless, and stress-free. We also offer many financing options to assist you in securing an affordable yet top-tier built Perry home. Call us at 801-264-8800 and let’s talk about your dream home.